If you have a small backyard, it doesn’t mean you can’t have a great backyard swing set for your kids! There are many small swing set options, and we’ve dug through them, sorting out the good from the bad, the sturdy from the flimsy. Here we’ll be sharing the 14 best swing sets for small backyards of 2019. There are a definitely a few things to think about when making your purchase, so we’ll take a minute to go over a buying guide first, then get to the reviews. By the time you’re done reading, I’m sure you’ll see a great swing set that will both fit in your yard, AND be a lot of fun for your kids! 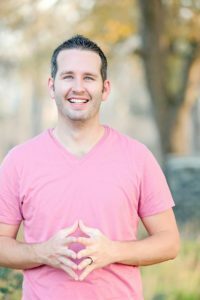 What features do I want (or do my kids want)? What materials do I prefer for the unit? How difficult will it be to assemble? Will it need anchoring? Do I only want to consider full swing set kits with everything included? You’ll need to know what features are most important to you and your kids. Here’s what I mean: Do they really want a slide? Does it need to be a “good” slide (long and taller)? Or are you looking really just for some swings? Are you comfortable with a trapeze bar? Or would your kids just LOVE a two person glider swing? Do you want a swing set that has an area designated for a sandbox? A play fort they can climb up to? 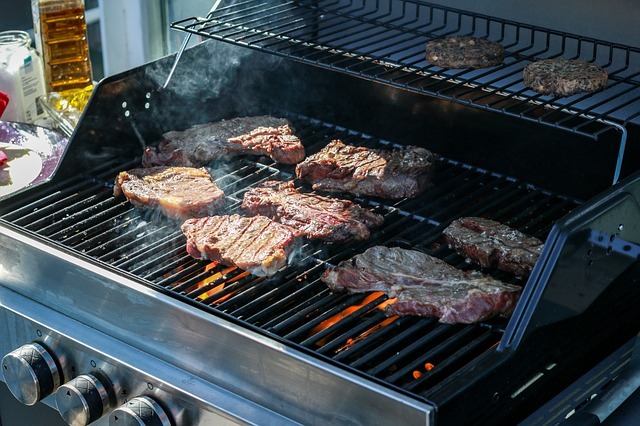 Thinking through and deciding on some of these features will help you cross off some options from your list quickly – meaning, you’re that much closer to picking your favorite! Another thing to consider is longevity: Are you looking for a swing set that will last your children from toddlerhood up until approx age 10-12? Or are you thinking you’d like to get one that your toddlers can really enjoy “for now”, that’s officially toddler-size and then replace with something different as they get bigger? There are toddler size swing sets AND swing sets that bigger kids will enjoy on the list below. What materials do I prefer? 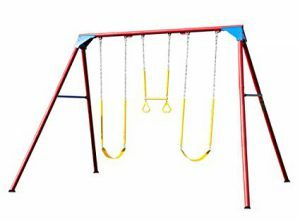 Several of the swing sets below are made of a combination of powder coated (rust-resisting) steel and plastic, and several are made of cedar. Cedar looks fantastic, but the wood may need to be sanded or treated annually to keep it looking great- are you up for that? The toddler sets are made primarily of a durable plastic – great for kids who are not as steady on their feet, but you may find they begin to look a bit childish as your children age. It’s all a matter of preference, really. All sets are durable, well built, and look attractive. How difficult will it be to assemble? Does it need anchoring? This is a hard question to address, as the skill levels of the assemblers are a huge factor. There are people who you can hire to assemble the sets for you if you prefer (think “local handyman” if you aren’t sure who to call). Most swing sets here will take several hours to assemble – especially if you’re doing most of it by yourself. Count on needing a second person to help with lifting the bigger parts or securing sections together. Many of the swing sets listed here require grounding with anchors – NONE require cementing. There are some free standing structures (see the Lifetime options); these have adequate weight and balance to simply sit on the ground, anchor free. This will also help you determine what swing set to choose. No surprise, even small swing sets can have both large or small price tags. These 12 range from approx $150 to $1500+… you’ll have to decide what you’re willing to invest for your children’s backyard fun. Will I only consider a full swing set package-in-a-box? There are many ways you can get a decent swing set into your backyard. One of them is to purchase a full swing set/play ground package, where everything from the wooden frame and screws to the swings and anchors comes in the box. You can also design your own or follow blue-prints, which some people love, others hate. 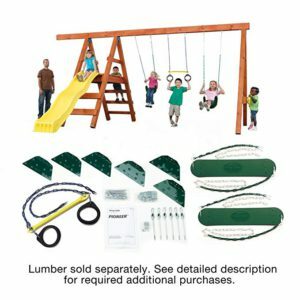 But there is also a middle-ground: swing set packages where you buy a box with the hardware and generally the swings included, but select and purchase your lumber and bigger accessories like the slide separately. These packages can save you money as you can look for sales and determine the quality of the wood you buy yourself, plus, you can customize it to your children… but it can be a bit more stressful. Plus if you’re budget conscious, you may find yourself spending more than you planned. How big is it? Will it fit in my yard? The term “small backyard” means different things to different people. For some, “small backyard” means the “postage stamp” sized lots that come with townhouses or some of the packed in residential complexes they are building everywhere these days. To others, “small” is simply a yard that’s not an acre or half acre country lot – they want a smaller swing set so it won’t take up “all” of the space they do have. 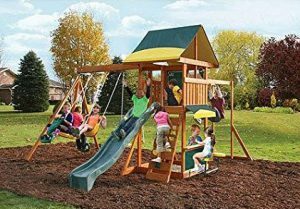 All of the 14 we feature are swing sets that don’t take up a TON of space compared to the big playsets out there, but not everyone may consider all of our choices small. Let’s see the top choices now. To get you started, here is a visual gallery of the 14 best swing sets for small backyards that are featured here. Click any of them to move quickly to our review. If you’re looking for an exceptional quality swing set for a small backyard, one that is built to last, requires no ongoing maintenance, and is sized to last your kids more than just the toddler years, we believe this is one of your best options. Even adults (or adult sized kids) can swing and play on this one, meaning you can join your kids in the fun! The official maximum occupancy is 6 with a total weight capacity of 640lbs. 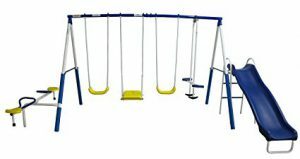 This metal swing set features 3 belt swings (adjustable heights) and 1 trapeze bar with gym rings, monkey bars with ladders at each end, a fireman’s pole and a 9′ wavy slide. Foot Print: Playset dimensions are 13.11′ x 18.9′, although the company’s official recommended play area size is 25.11′ x 33.7′. Structure: This is a free standing structure, meaning it’s not cemented to the ground, and does not come with tie-downs. Although some customers have done so anyways (with products not included), according to the many reviews we read through, this is absolutely not required due to the layout of the set. Apparently there is no “hopping”, even with large kids and adults swinging their hearts out. Assembly: Being a free standing structure, it’s also a lot easier/quicker set up. According to reviewers, Lifetime Products labels the boxes very carefully and instructions are clear. Assembly is easiest with 2 people, as it is a heavy structure, and you can count on a few hours (expect something between 3-6 hours total). You are able to have the swings on the right or left of the slide, based on what works best for your backyard. Warranty: Lifetime Products has a great a very solid reputation for going above and beyond for clients as far as warranty and replacement parts should there be a need. Your kids would have so much fun in this multi-level small play set! It’s recommended for kids aged 3-10, so you’ll get many years of fun out of this one – and it’ll be popular with the whole neighbourhood. Features: For a small footprint, it contains a surprising number of activities! A step ladder and a challenging climbing wall leading up to an upper play house complete with “sun deck” and lookout windows (height is 5′ from the ground), a lower play house complete with doors, windows, and a snack bench for 3, two belt swings and one two-person ships-wheel glider, and one 8′ wavy slide. Footprint: The swing set itself is 16′ 8 1/16″ x 13′ 10 15/16″. Remember that for it’s recommended to add 6′ to all sides to create that “safe play zone”. Material: This swing set is built from tight-knot 100% cedar, laboratory-tested to ensure it’s rot-resistant. It’s pre-stained (chemical free stain) and each piece is pre-stamped with the piece number for simpler assembly. All of the plastic pieces are UV-coated to resist fading. 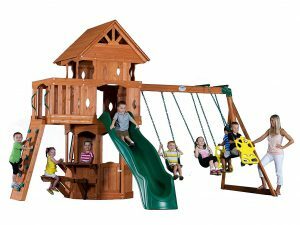 Another Lifetime Products swing set that tops all expectations is this Big Stuff Adventure set. You’ll have a very tough time getting your kids OFF of this swing set – it’s packed with fun elements! Features: Kids can climb up to the clubhouse via the inside or outside of a sturdy 3-D climbing wall, by the cargo net, or up a climbing ladder (beside the slide). Up top under the hardtop roof they can spin the ship’s wheel, draw on the activity chalkboard, peek out through the binoculars, or zip down to the ground on the 9′ wavy slide. The attached A-Frame swing bar holds 2 adjustable belt swings and a trapeze bar with rings – and underneath the playhouse you’ll find a fun propeller swing! Footprint: The swing set actual dimensions: are 13’ 11” x 15’, but factoring in extra space around it as a “safe zone”, Lifetime Products recommends a play area of 29’ 8” x 27’. Assembly: According to the official users’ manual, this swing set should take between 6-8 hours to assemble – 2 adults advised. This is a free-standing structure, with extra-wide legs, so no cement is required for stability! 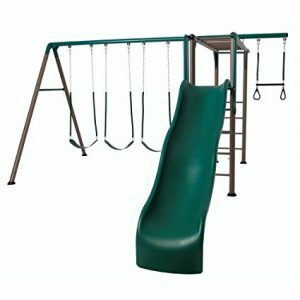 Materials: This swing set play structure is made of top quality, heavy duty materials. The steel is powder-coated for rust-resistance, and all plastic pieces are UV-coated. The swing chains have rubber grips, and all edges throughout are capped or rounded. This UFO swing or “Flying Saucer” is a completely different idea for those of you looking for the best swing sets for small backyards. 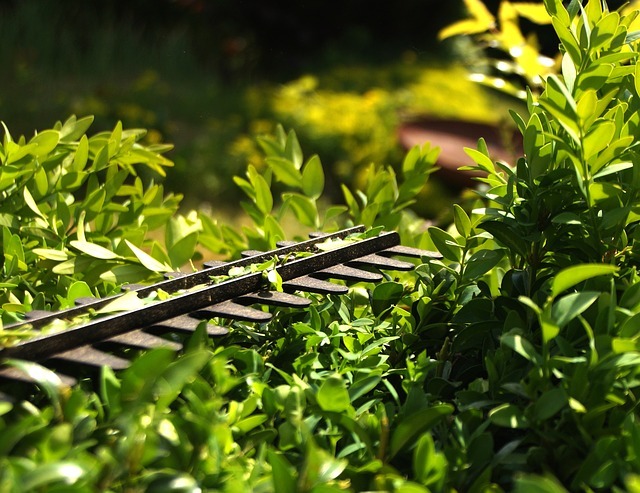 Perhaps your backyard is truly SMALL – maybe a townhouse yard? This swing set features just the one swing, but it’s a fantastic option – and at an attractive price! Footprint: The fully assembled product dimensions are: 84″L x 69″W x 73″H. The swing seat is 40″ diameter, and the edge of the swing is 29″ off the ground. Weight: The recommended single user weight is 110 lbs and total weight should not exceed 200lbs. (It is factory tested for up to 440 lbs though… so your call) and it is geared towards kids aged 3-8. It is safe for 2 or even 3 small children to swing in it together! Assembly: Many reviewers were quick to note that this product should be stabilize or staked into the ground to avoid movement of the frame while you’re swinging. There are holes at the bottom of the poles actually intended for stakes, but the stakes themselves are unfortunately not included. Old camping tent stakes work fine, or you can purchase an anchoring kit. 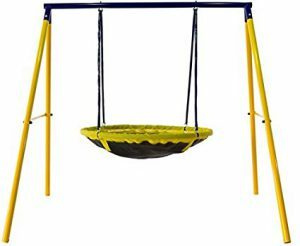 The Swing: If you happen to have gone to a public playground where there was a disc swing like this, you’ll know how it draws kids like magnets! So fun! The swing itself is made of a material that apparently feels similar to that of a trampoline (although not bouncy). Kids can either lay in it somewhat like a cradle while they swing (apparently it feels similar to the sway of a hammock), or they can sit with their legs dangling over the sides. It’s a bit like a flying saucer… and kids LOVE it! The swing chain has a rubber protective covering on it to avoid any small fingers getting pinched. You can actually remove the swing and replace it with different types of swings if you want to – perhaps a traditional swing for a while, or maybe a tire swing or glider. The connecting parts where you clip on the swing are wider apart than those of a regular swing though – just a head’s up. And also note: the swing height is not adjustable. Lifetime Products holds 3 of the top 5 swing sets for small backyards – this is the 3rd metal play structure that’s worth a look if you don’t have a huge yard but still want a fabulous swing set that your kids will enjoy for years and years to come. Features: This sturdy clubhouse has a rigid hardtop roof, an impact-resistant skylight, four storefronts, two doors, a sandbox (in the lower “clubhouse”), two swings, a trapeze, a 9-foot wavy slide, a steering wheel, two chalk boards (reviewers overall aren’t impressed with them), an arched climber, two climbing walls, and a car map. Footprint and Capacity: The actual playset dimensions are 16.5′ x 16.5′. Add in the recommended safety zone around the playset and you’re looking at 30.2′ x 31.5′. It’s capacity is 10 kids or 1600 lbs – the slide, swings, and trapeze have a recommended weight limit of 150lbs each. 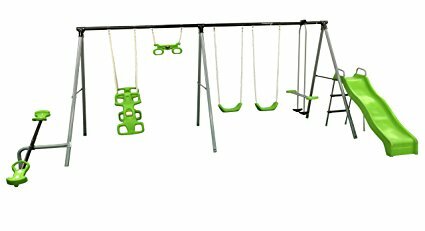 Materials: Lifetime swing sets are built with heavy duty powder-coated steel that is extremely rust resistant and weather resistant. All plastics are UV-resistant so they won’t fade with time. There is no lead-based material used, and all hard edges are rounded or covered with plastic caps for safety. The swings have rubber grips on them to protect against pinching. Assembly: This is a free standing structure, meaning no cement pouring is required. (It does come with anchors, but it is an extremely heavy and stable swing set even without their use – according to reviewers. The wings, ladder, and slide balance out the weight of the central play tower.) You can expect it to take 2 adults between 6-10 hours to assemble – apparently the instructions are very clear. If you’re looking for just swings, this is the swing set that you’ll probably be most happy with. This swing set is officially geared to children aged 3-12 but it can hold the weight of most adults – so your children will be able to enjoy this for many years. It’s no toddler-sized swing frame though – the picture looks a bit deceiving. Footprint and Capacity: The actual swing set dimensions are 13.6′ x 10.6′, but adding on the recommended safety zone, Lifetime suggests an ideal play area of 33′ x 36′. This is one tall swing set -10 feet tall to be exact – you actually need a ladder to hang the swings! As for weight capacity, it’s recommended that you don’t exceed 405lbs total (or 135lbs per swing when all are in use). 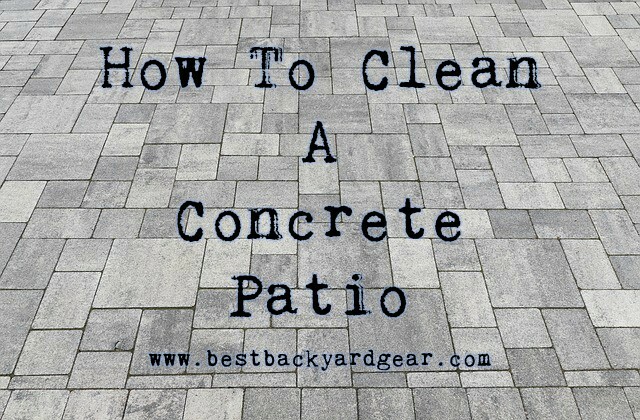 Materials: It’s weather-resistant, rust-resistant, and virtually maintenance free! Assembly: This is a heavy-duty free standing swing set, meaning you do not have to anchor it down. That being said, apparently if you don’t have it perfectly level, it does rock a bit with heavy users – and if you really want to be safe, you can purchase an anchoring kit (stakes) or even go as far as cementing the poles into the ground. But according to Lifetime, and many, many reviewers, it should not be necessary. Lifetime offers a 5 year warranty – and apparently their service is phenomenal! This next one is, as you can obviously tell, is very similar to the Lifetime Swing Set we just finished looking at. However, there are a few key differences that make it well worth showing as well. First off, it is shorter, with the top beam at 7’8″ (the Lifetime at 10′). Thus it requires a smaller footprint especially when you add it a safety zone, which might be good for your small yard. Secondly, unlike the Lifetime one it’s frame is made of wood… wood that YOU select and purchase at your local lumber yard or Home Depot, bring home, trim, and fit into the hardware that comes with it. No angled trims required! Overall, this set is another solid option if all you’re looking for is SWINGS and a fun trapeze bar (which you COULD replace with a 3rd swing or something else if you don’t care for acrobatics). Now, a bit of a different option for small backyard swing sets – one geared towards toddlers. 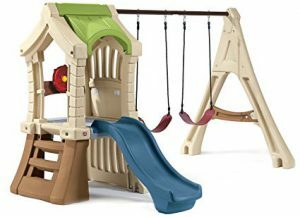 These are fabulous play sets for when your children are young – but they do tend to grow out of this style of swing set much faster than other styles. While the manufacturers recommended age is 3-6 years old, most reviewers suggest it’s more appropriate for 14months – 4 years. Step2 is a very well known brand for kids play things, and this swing set is one of their products that has high ratings and many reviews. 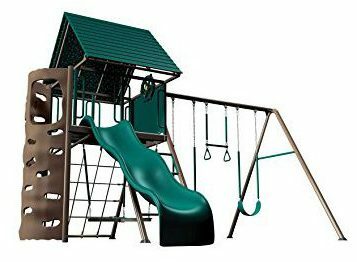 Footprint and Capacity: The maximum weight is 240lbs – and the assembled footprint is 84″ L x 111.5″ W x 75″ H.
Features: This swing set is perfect for young toddlers who want to climb, swing, slide, and imagine. It comes with two belt swings – but as you’ll probably purchase this when your child is a bit too young for “big kid swings”, it’s good to know you can very simply remove the belt swing and clip on your own bucket swing. The swing chain lengths are a pre-determined length… if you find they are too long, unclip the swing, tie a knot or two in the chains and then re-hang. The play house is well suited to toddlers and little kids – it’s not too high, but has fun features such as the steering wheel, the ladder, and the slide. The shape and colors of the playhouse makes it feel like a fort – your little ones will love that! The ladder steps are close together and reviewers say that even young toddlers can figure them out. The slide is about 3′ long, and fairly steep – your little one will need to discover how to stop himself/herself at the bottom! Materials: The whole fort is made of a durable poly-plastic – all parts other than the bar from which the swings hang. Assembly: The included instructions are simple to follow. It comes with 4 U-shaped anchors that you slip through the holes in the legs and then hammer into the ground – it does not require any cementing! You can put it directly on your lawn – you don’t need to create a special playground pad. Here’s a fun swing set for a small backyard – it includes a small slide, two swings and a trapeze bar, an exercise trampoline, and a handy UV sun shade! It’ll bring out the gymnast in your child and will be a great tool for getting energy out. Footprint and Capacity: If you have a small or awkwardly sized yard, you’ll love that the trampoline is not actually attached to the swing & slide set! You can set it up wherever suits you – it even comes with its own anchors! The trampoline size itself is 42″, and has a weight limit of 100lbs – it’s not really made for adults. The swings can handle up to 100lbs each as well – and you are able to put other swings on if you prefer something different (like a baby swing). The actual footprint of this swing set is 13’6″L x 10’3″ W x 6’5″H (8′ with the sun shade). The recommended safety zone by IronKids is 18’6″L x 16’3″W x 14’H. The maximum weight capacity of the whole set is 600lbs. Materials: The frame is made of powder-coated steel, not plastic – apparently it’s very sturdy and well finished. The canopy is a great “extra” feature with this swing set – especially in yards that have no natural shade. You do not have to install it, however – but apparently you’ll have to watch out for the ends of the pipes that secure it, that you aren’t going to bump into them. Some people actually cut them off for safety if they aren’t intending to use the canopy. You may also want to temporarily remove the canopy if you are expecting high winds in order to prolong its life. Warranty: This product comes with a limited lifetime warranty on the frame, and 6 months coverage on all other components. 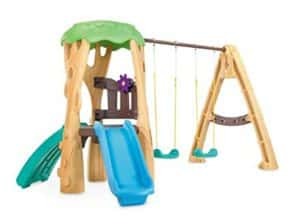 Cedar Summit is a brand under the KidKraft name that has a fairly large variety of larger playsets – this is one of their best rated swing sets that will fit smaller yards. Like all of their products, this set is built of 100% Cedar, pre-treated and pre-stained. Footprint: The size of this assembled playset is 12′ 11″L x 12’9″W x 9’H. Remember to account for approximately 6′ extra all around for an appropriate safety zone. Assembly: This is a swing set with a lot of different components – you should count on it being quite a big job to assemble it (average comments say it’ll take about 10 hours). That being said, the instructions apparently are clear and the pieces labeled well. Warranty: Some people worry about building play sets with wood – they worry it’s going to rot or split. Cedar Summit does offer a 1yr warranty for defects in materials and workmanship, and a 5yr warranty for wooden parts against rot and termite damage. It IS recommended that you apply water repellent sealant on an annual basis to best protect the wood, however. This swing set for small backyards is a fun one for younger kids. Like the similar Step2 toddler swing set above, it isn’t meant to be “THE swing set” that your kids will enjoy throughout their whole childhood. It’s good for ages 18 months – 5 years or so (although officially it’s for kids aged 3-8). Features: This set has a fort that’s designed to look like a tree fort. Kids can climb up to it via the sloped “climbing wall” at the back, or via the knobs on the “tree trunks”. They can peer through the “lookout holes” in the trunk, or spin the wheel to steer wherever they desire. The slide has side grips and the two (adjustable) swings can easily be swapped out for toddler swings or other swing options. 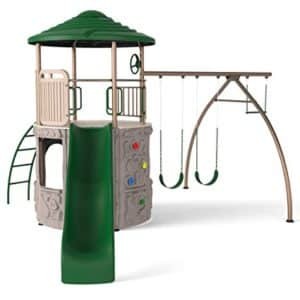 The whole playset other than the swing bar is made of a durable polypropylene plastic – it does not get burning hot in the summer sun, and stands up well to winter weather. 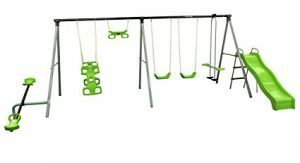 Footprint and Capacity: This swing set is 139.00”L x 93.44”W x 80.90”H. Remember to allow for a safe zone around the set – especially by the swings! The max weight per child is 81lbs each. The “tree fort” has an official max of 4 children (so, 324lbs max on the structure, 81lbs max per swing). Bonus: These plastic swing sets hold their value – although they won’t be popular for many years with your child due to the rather toddler-geared style and size, they are easy to resell – and are not all that difficult to transport. Note: This swing set is the exact swing set we have in our own backyard for our kids aged 4 and 2. It still looks like new after 2 years of use, and it still gets played on happily. The only issue we have with it is that it sometimes “hops” when both children are swinging together, even though the set was anchored and “re-anchored” to the ground. It took less than 3 hours for me to assemble. This is a good option if you’re looking for something fairly inexpensive, yet that comes with lots of options for kids to enjoy. It will fit a smaller rectangular yard quite well. Flexible Flyer offers a large range of models with various attachments and arrangements – this “World of Fun” model is one of the best rated. Footprint and Capacity: 216″W x 102″D x 72″H . This swing set has a weight limit of 105lbs per seat, with a total maximum weight limit of 1050lbs. Features: It features all you see in the photo: a see-saw, 2 fun flyers, 1 trapeze bar, 2 swings, and a 6′ wavy slide. The set does not come with anchors – if you’d like to add them (a good idea), you’ll have to purchase a kit separately. Materials and Warranty: The frame is powder coat painted (silver and black) for strength and stability. According to reviewers, it’s very sturdy and great quality! The product is backed by a 180 Day limited warranty through the company should there be any problems. 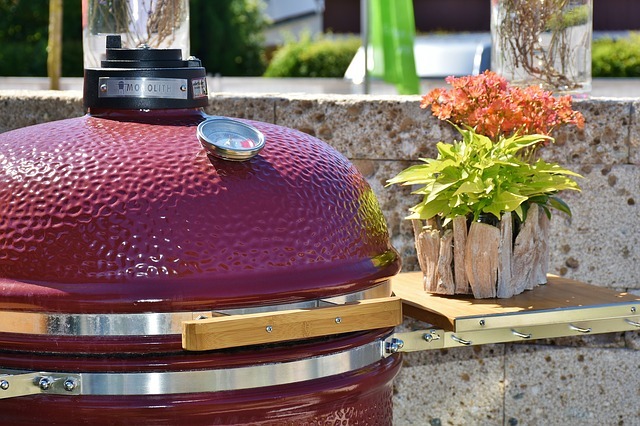 This is another great option if you’re looking for something entertaining for a small backyard! For the price you pay, it’s a very decent backyard swing set – and it should stand the test of time, as XDP stands for “EXtremely Dependable Products”. Footprint and capacity: The assembled footprint is 165″ L x 106″ W x 76″ H (also add in approx. 6′ on all sides for the safety zone). The swing set has a maximum weight capacity of 800lbs, with an advised seat weight limit of 100lbs. Features: Kids will love the unique Stand-and-Swing – you don’t see them very often! The teeter-totter swing, the see-saw, the 2 regular swings, and the slide will all provide lots of fun for up to 8 kids at the same time. The colors are available only as seen in the picture. Assembly: This swing set unfortunately does not come with an anchor kit, but based on reviews and the product manual itself from XDP, it’s “highly recommended” that you pick up one for this set – it moves a fair bit without anchoring, and can be dangerous. Another unfortunate fact about this swing set is that the swing heights are not adjustable, nor can they be swapped out for a different style swing. Materials: It is a sturdy metal set with welded corners and powder-coat painted for durability. The 4 frame legs are covered with foam padding for safety, and the swing chains have coverings to protect little fingers from getting pinched. All of the plastic pieces are actually blow-molded with a high density polypropylene material so you won’t have any rough edges. There is a limited 180 day warranty from the manufacturer on this swing set. Next we have a swing set hardware package. It does NOT include everything, heads up. 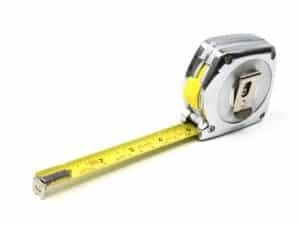 You will need to make yourself a bit of a list, then head over to your lumber yard for the wood (and screws), plus you may want to add perhaps another accessory for the cantilevered area. Footprint and capacity: The assembled footprint is 192L x 168W x 96H (also add in approx. 6′ on all sides for the safety zone). The swing set has a maximum weight capacity of 115lbs per swing. 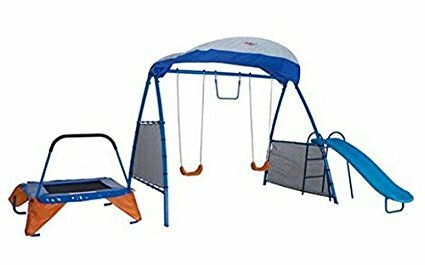 Features: This is a basic swing set with 2 swings, 1 trapeze bar, and a slide… with room to add one more swing/accessory of your own choosing. Assembly: This set includes everything but the wood and screws, so your first step in assembly will be to purchase them… but afterwards, follow the included instructions. 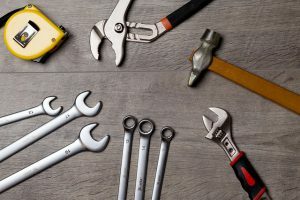 You’ll need to have basic tools for this job, including: Circular Saw, Electric Drill, 1/2″ Socket & Wrench, Hammer, Tape Measure , Carpenter’s Square, Safety Glasses and Dust Mask, 1/8″ and 5/16″ drill bit (long), 1-1/8″ Spade Bit, Phillips Bit. Materials: The wood is up to you! Besides that, the slide that is included actually has a lifetime warranty against cracks and breaks. The swings have real chains that you can adjust based on the heights of your children, which is pretty important. After you’ve done your homework and selected the swing set that’ll work best for your yard and family, all that’s left to do is assemble it and show it to your kids! Imagine how excited they’ll be, and all the fun they’ll have on it this summer! 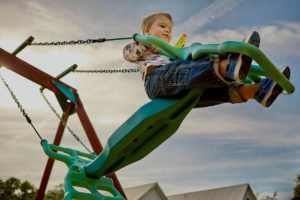 Thanks for checking out the 14 Best Swing Sets for Small Backyards of 2019 here at Best Backyard Gear. If you have any comments or questions, leave a comment below and we’ll get back to you as soon as possible! Thank you so much for your review and comparison. Based on this I think we are ready for the final pick to our swing. The kids have been asking for this a long time. May I ask if you have one and which one that would be ? I would very much appreciate your opinion. Thanks for commenting! Which one are you guys eyeing? It’s a tough call, but in the end, your kids will probably love any of these small swing sets! We personally have the Little Tikes Tree House set (#10 on the list). We bought it 2 years ago when our daughter was 2 and our son 7 months, and it has now been used through 2 summers (and as much spring and fall as we can get in, weather wise). Our kids love it, especially the swings. We did end up buying two toddler swings for the first summer, but we have already transitioned to the “big kid swings”. It’s SO easy to switch the swings back and forth, to raise and lower them, etc. Our kids have a lot of fun in the “tree fort”, and although the novelty of the climbing wall has worn off for them (they prefer climbing up the tree trunk itself, or up the slide), whenever new kids come to play, it’s always a highlight. We’re really happy with it. I know it won’t last too many more summers (kids grow so fast), but it’s still looking so “new” that I can’t see us having much trouble at all selling it. The ONLY thing we aren’t loving, but that we’re just “putting up with” is that the anchoring just doesn’t want to stay put… if I push the kids in the same directions side by side, it hops a bit. Not too badly, but enough to notice. All the best with your selection, and have fun! What a really nice site. Plenty of educational information for us to make a decision. After looking carefully and locating a spot that I think it will fit, we have decided to go with number 5, the tower. My children like to climb, especially my son. This would work out great for the all of us. Do these require a handyman to put together? What do your recommend? Thanks so much for stopping by, and I hope your kids absolutely love the Lifetime Adventure Play Set! I think the answer to your question is that it depends on how handy you are yourself, and if you’re interested in taking on a project like this. Setting up a big structure such as this playground can take a while – reviews of this set indicate that it’ll take 2 adults between 6-10 hours of work to get it together. If you are methodical and organized, able to follow the (very clear) instructions, and willing to do some drilling, hammering, etc., I think it’s definitely doable yourself! If it’s too intimidating or you know it’ll frustrate you, or if you just don’t have the time, you can totally just pay someone to assemble it for you. If it were me, I’d make a few calls to some local handymen and ask for some quotes. I’d show them the picture and even email them the assembly instructions (available here ) to see what they think. Wishing you and your family much outdoor enjoyment with your new swingset! Hey there! I just moved into a new house with my brother and my nephews and nieces. My brother wanted to have a swing set in his backyard for his sons and daughters. I searched some on the internet but I can’t find which one is the best. Luckily, I found your article that list the best swings for small backyard. I will surely show this website to him to make him pick which swing should we buy. Thank you for sharing this information. Hi John, thanks for commenting! I’d love it if you shared the article with him… picking out a smaller swing set for a smaller yard is no easy feat! 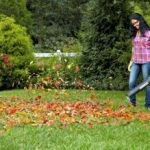 My husband and I went through that chore last year – the lack of info out there on what’s available is what prompted me to write this post. (We bought the Little Tikes Tree House set… our kids love it!) It’s my hope that your brother and whoever else stumbles onto this website finds this helpful! Congratulations on the move, by the way! Wishing you and your extended family much happiness there together! Thanks so much for writing a good review to help me to pick the right swing set for the boys, my pick is number three, this set will give them some fun and at the same time some exercise. I have to agree with the authors kid opinion, it looks amazing and I know my boys will love it too! Don’t these swing sets make you want to be a kid again? I know they do for me! 🙂 Another thing I love about #3, the Lifetime Big Adventure playset, is that I could go on it too! I can imagine plenty of games of tag or creative fort play with this fun playground! Thanks for writing in, and have a great day! I enjoyed swing sets so much when i was a child! They have definitely improved them since i was a kid! These are great options to choose from and you organized them so well! Thank you! I will definitely look into this in the next year for my daughter! I can just picture her now having a blast! I love watching my kids enjoy our swing set too. My two would seriously swing for hours if they could! Have a great time picking out the perfect swing set for your little girl! Thanks for the encouraging comment, Spencer! Cheers! You can still get a swingset even if you have a small yard, compact play space, or irregular-shaped area. Only modular, customizable playsets like ours can adjust for different yard sizes and tight spaces. Hi Hannah! I’d love to check out some of your modular swing sets for small yards – can you share some information? Thanks! Always looking for new and fantastic ideas!